Imagine nodding “Good morning” to Yassar Arafat or Boutros Boutros-Ghali, the Egyptian Secretary General of the United Nations, as you pass them in the hall; or riding in an elevator with Nelson Mandela; or watch as President Bill Clinton, surrounded by secret service agents, walks down the hall ahead of you. It’s not something most people from a small community on the West Coast of the United States even think about. These are newsmakers, world leaders, figures that the history books will tell our great-grandchildren about. A former long-time Lorane resident who recently moved from Lorane to Eugene, saw these people, talked with some, and took part in the world community at the United Nations in New York in the latter part of 1993. Is it accomplishing the goals that its founders envisioned? “It’s coming closer to accomplishing the goals than it would have if it never existed,” says Ron. Ron’s personal experience at the U.N. centered around his research of the methods used in its Human Resources training program. He found that there is a massive difference in the “work place cultures” of the U.N. and that of corporate America. He spotted areas where communications, especially, were out of sync with the times and mired in bureaucratic paperwork, reflecting an old-school management style. Memos were still circulating from office to office, piling up on the desks of those who must dictate responses, sign letters, and fill up file cabinets with tons and tons of paper. Large corporations just across the river, however, have adopted computer systems and electronic mail systems that allow their members to communicate electronically to others within the company as well as those across the U.S. and in other countries. Using vast computer network systems, one memo can now be sent from one computer to dozens and even hundreds of others in moments, eliminating the reams of paper that would have been used with the older methods. Ron made observations and came up with some suggestions for change while he was there. He suggested that members of the U.N. staff take “field trips” to various corporations, visiting their Human Resource departments; he also suggested that they be allowed to sit in on training sessions at these same corporations to observe and learn how to move the United Nations into the electronic era. He was not with the U.N. long enough to draw up any definite proposals, but managed to pique the interest of members of the Ford Foundation who would like him to explore his suggestions further and possibly present a formal proposal to them at a later date. The Chief of the New York office of the Center for Human Rights, and Ron’s boss, was Elissavet Stamatopoulou from Greece. Other staff members were from Haiti, Sweden, Italy and Bolivia. On another project, he worked with people from Italy and Germany. It was truly an international experience for him. He became especially interested in UNICEF, the United Nations Children’s Fund, while there. He asked that I share some information gathered by UNICEF with his friends in Lorane. * There are 20 million children alive today that wouldn’t be alive this year if not for UNICEF. * $25,000 are spent each second on the world’s weapons; $18 billion are spent each year on the world’s military. * $380 per child are spent each year on the education of the world’s children; $20,000 per soldier are spent each year on the world’s military. * One-fifth of the world’s annual arms expenditure would abolish world hunger by the year 2000. Ron felt that he personally benefited from his experience at the United Nations. It enriched his life and temporarily extracted him from “his daily life environment,” but it is not something he would want to do on an everyday basis. The intensity and magnitude of work being done at the United Nations is a heady experience, but Ron feels that he can use his experience and expand on it from his home environment on the West Coast. He’s once again back at work for MCI in Eugene, although the big city life might have rubbed off on him a little bit. He may possibly transfer to a position in Seattle soon. His friends wish him well. to Lasting Peace for ALL people. I walk these Sacred Halls, with you. With deep Gratitude I greet you. Public Servants of the world. or keeping this house beautiful. I am researching my husband’s family which settled in that area in 1853. 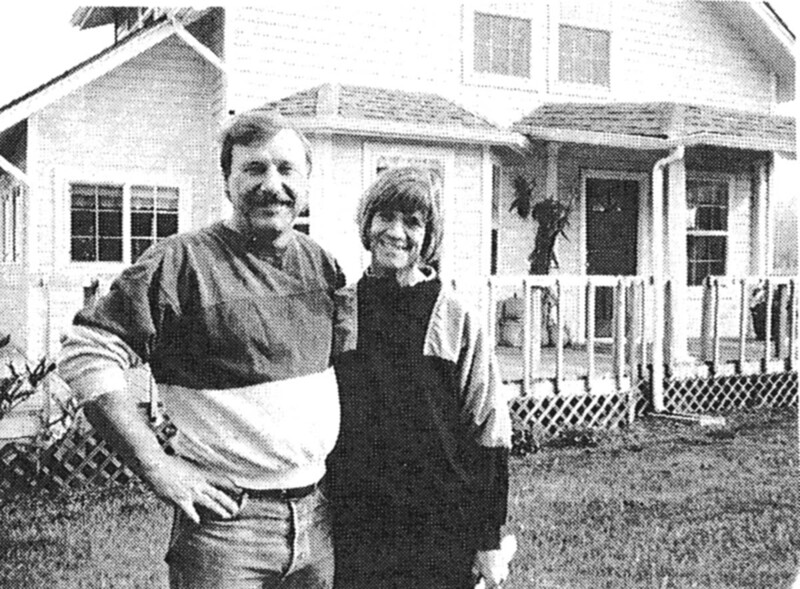 Anderson Barlow and his wife, Melissa Melvina Lane, lived in the Siuslaw area until Anderson’s death. They had six children. One of them, Joseph, died in The Dalles at the age of 24. Another, Andrew Jackson Barlow, remained in the Siuslaw for some years after his father died in 1879. He then moved on to Gold Hill, near Medford and then to Port Stanley, Washington (in the San Juans). Two of the other sons, Andrew and Charles married Salem girls and moved to the Spokane area ca 1890. Charles was Gary’s (her husband) great grandfather. There were two daughters. One, Mary “Mollie,” married Reverend Joel Martin and they had one son, Charles E. Martin. I do not know what happened to Joel or the marriage, but Mollie later married Isaac McClung and moved first to California, then to Republic, Washington. The other daughter was first married to an Emerick and had twin daughters. Again, I do not know the circumstances, but she later married a Welsh and had another child. All three children (Ada and Ida Emerick and Ava Welsh) were living with Joel and Mollie Martin, their son, Charles E. Martin, and Melissa Barlow in the 1880 census of Lane County. They were right next door to Andrew and Ellen Barlow, son Charles, and stepson Harvey Hazelton. I find no trace of Virginia Welsh and her husband. I would like to inquire as to any additional information you might have on any of these individuals. I have a tremendous amount of information of Melissa Melvina Lane’s family since her father, General Lane, is the subject of much material at the Oregon Historical Society. I have never been able to find anything on Anderson Barlow except that he was born in Harrison County, Kentucky in 1810. I have searched the records of that county but have never located Anderson’s parents or any siblings. There is mention in the Eugene Register-Guard of Anderson’s illness in June, 1879, but no mention of his death a few weeks later nor any obituary to provide any clues to his ancestry. The following are some records on this family that I was able to find for Mrs. Fasano. The names that we know to be Lorane-ites are in bold type. A.J. Barlow married E.C. Hazelton, 1 Sept 1878, at the home of Nat. Martin; witnesses, Joel R. Martin and Amanda Cathcart; William N. Crow, Justice of the Peace; Sur: Frank Whipple. Joel R. Martin (over 18 years) married Mary E. Barlow (over 18 years), 17 Nov 1878, at the home of A. Barlow by W.N. Crow, Justice of the Peace; witnesses, Jesse Martin and E.A. Jackson; Sur: S.B. Eakin, Jr.; consent filed. J.M. Emerick married A.J. Barlow, 25 May 1870, at house of William Barlow; witnesses, A.J. Barlow; Minister: Samuel Dillard; Sur: Andy Barlow (not recorded until 20 May 1872). Frank Welch married Virginia Emerick, 1 July 1874, at house of A. Barlow by Mathew L. Mann, minister; witness, James S. Ozment; Sur: G.B. Dorris. J.S. Martin married Mary A. Doak, 19 Oct 1884, at house of A.J. Doak by Hiram Wingard, Justice of the Peace; witnesses, J.A. and W.S. Leonard; Sur: T.M. Doak. W.H. Martin married V.I. Doak, 4 Nov 1880, at house of A.J. Doak by Hiram Wingard, Justice of the Peace; witnesses, L.F. McPherson and George Landreth; Sur: T. Doak. Anderson Barlow (born Harrison Co., Ky, 23 Jan 1810) died 6 June 1879, Lorane Grange Cemetery. I find that it would be very difficult for me to be totally committed to any issue, idea, or belief. There are so many areas of grey attached to the black and white. I am presently filled with so many conflicting emotions these days as I gaze out my kitchen window at the much-loved view that our family has had for the past 27+ years. That view has been part of our life, our existence. It’s home, it’s security, it’s family, and soon, as I understand it, it will be altered beyond recognition. The timber has been sold and the logging crews will soon be moving in to harvest the bounty from the slopes where we have frequently ridden horseback through the dappled shade. There is no one I can honestly blame for what is to be a great sadness for our family when the first chain saw begins it’s roar. I can’t blame the previous owners; they are friends and selling their land was their right. I can’t blame the new owner. He bought it as a business venture. He does not live in the valley and does not have any emotional connection to it. I can’t blame the loggers. They are making a living and supporting their families in a business with a proud and respected history. I can’t blame the ecologists. They share my love for that “dappled shade.” I guess, if I really need to blame, I can blame the excesses of any belief in an issue…the rigid “in your face” inability to compromise that permeates so much of our lives. It’s that type of mentality that ties up our lives and livelihoods awaiting court decisions that end up hurting everyone and helping no one. Our family will be joining all of the others who are paying the price for it. I was greatly interested (in Sawdust and Cider) because my mother was born in Lorane in 1878. Her younger brother was born there in 1880 and possibly the youngest sister. I am not sure about that. Their parents were Madison Nordyke and Eleanor Willis Foley. Madison’s oldest sister, Harriet, was married to Michael Crow. I am anxious to find out if the community of Crow (Crowe?) was named after that family. According to census data, the family of Richard Crow must have been neighbors to my grandparents. The census also shows Harriet to be in Douglas County in 1870 and 1880. So it doesn’t appear that Harriet’s family was ever in Lane County. I had intended to include a profile on two of my favorite people in Lorane, Lincoln and May Diess. Bob and Marna Hing have even volunteered to do an interview on tape for me. But, alas, it will have to wait till next month… the fishing has been great, according to Marna, and it has been impossible to get either Lincoln or Bob to stay home long enough to do an interview! IS THIS THE LAST ISSUE OF THE HISTORIAN? Thanks to my very generous husband, the Lorane Family Store is underwriting the printing costs, so there are no charges to you. Please help keep the newsletter going! Were you someone, like myself, who watched with fascination as the remodeling crew transformed the former Seales’ family homestead on North Territorial into a showcase home? You’ve probably been wondering who the new people are who have moved into it. Because they both work in Eugene, they haven’t had the chance to meet many of their neighbors yet. So, I’d like to introduce you. Meet Dave and Carol Johnson. They moved into their “new” home on August 8, 1993 when they purchased it and about 20 acres of land from Otto t’Hooft who bought it from the Welmer Seales’ estate. It was he who had the house completely remodeled. Dave and Carol own Keeper Import Service in Eugene where he is the owner/mechanic. They opened the import car repair shop 10 years ago. While Dave runs the business, Carol has been working in the classified advertising department of The Register-Guard for 8 1/2 years. Before moving to the Lorane area, they lived in Eugene for 14 years. In fact, Carol grew up in Eugene. Her father owned and operated Little’s Market near the University of Oregon for about 25 years. Dave lived, as a young boy, in Idaho where his family still lives. He went to high school in Grants Pass. Both continued on to college; Dave at the University of Washington and Carol at Linfield College in McMinnville. The Johnson’s have two sons. Jeff, 25, lives in Portland and works for an advertising agency. David, 23, and his wife, Valorie, have a 10-month-old daughter. They live in Eugene. When I asked Carol and Dave what they specifically enjoyed doing for recreation, they seemed to flush and confessed, “We’re cyclists. I know that people in rural areas don’t like cyclists much because of the narrow roads. But, we follow the rules of the road and don’t ride in ‘packs’ or races. We just enjoy riding our bikes for exercise and a way to enjoy the beautiful scenery up close.” I reassured them that we don’t shoot cyclists in Lorane (although we have had problems in the past) and that we can certainly appreciate their love for the Lorane countryside. In addition to cycling, the Johnsons love to go fishing, boating, camping, and hiking. Collecting antiques, cooking, and traveling are also on their list of favorites. Mrs. Vida (Richardson) Bullis shared some of her memories of Lorane and gave more information on some of the pictures that were used in Sawdust and Cider in a letter that she wrote to Tiny and Monte Ramp of Crow in 1988.